What is it with Hollywood's pre-occupation with sequels? It's not enough to produce one movie? You can't come up with a fresh idea for a new movie? You gotta go back to the well two... three... even four times? 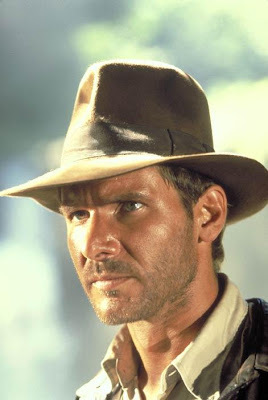 In 1981, Harrison Ford starred in a hugely successful movie called Raiders of the Lost Ark. It was so successful George Lucas and Steven Spielberg decided to do a sequel in 1984 and Harrison Ford starred in Indiana Jones and the Temple of Doom. It was so successful... ...yeah, you got it - H.F. in Indiana Jones and the Last Crusade in 1989. ...Messrs Ford, Lucas and Spielberg came out with a fourth in the franchise, last year's Indiana Jones and the Kingdom of the Crystal Skull . 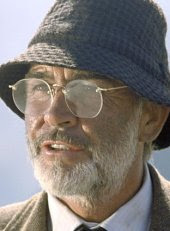 At 65, Ford was practically using a walker for the latest installment. Now comes word, there may be a FIFTH adventure committed to celluloid. That's right, currently 67, Ford says if the script was right, he'd do it. Let's see, once the script is written, financing is arranged, actors are cast and the blockbuster is filmed Ford'll be lucky if he's still this side of 70. Indiana Jones and Are You Out Of Your Friggin' Skull? "Ya can't do it without me!" How about Indiana Jones and the Last Hurrah? The real question is how old will Sean Connery be by that time? My personal fave: ... the Dementia of Gloom! Indiana Jones Can't Quite Remember What He Climbed The Stairs For? CatLady: Yeah, that should have been the name of the 2nd movie. UR: He's 79 now. I dunno - dead? Quirks: Well, I try. I eat right, brush after every meal and I take multi-vitamins. Perfect! Then we'd have good reason to get an 80 year Clint Eastwood back in the saddle again or carrying a .44 magnum. The most powerful handgun in the world, and will blow your head clean off. Punk! Don: Great movie. The full quote was: “You've got to ask yourself one question: 'Do I feel lucky?' Well, do ya punk?” Did you see Gran Torino? Not bad for a 79 year old coot. Come help me "start over". Geesh, the dude could barely walk in the last film. I can't believe they're going to cast him another one.